Prime Waterfront location on San Diego Bay. Offers a resort-like setting with bay view rooms. Five minutes from the airport and walking distance to San Diego Convention Center, Seaport Village Headquarters and Gaslamp Quarter. Easy access to San Diego Zoo, Sea World and Beaches. Top of the Hyatt: Top of the Hyatt sits high above the San Diego Bay with panoramic views of the city, Coronado Island and beyond. Located on the 40th floor of the Harbor Tower. Market One: Open 24 hours and serves Coffee, Hot and Cold breakfast, lunch, and has light dinner items. Also sells gifts and local products. 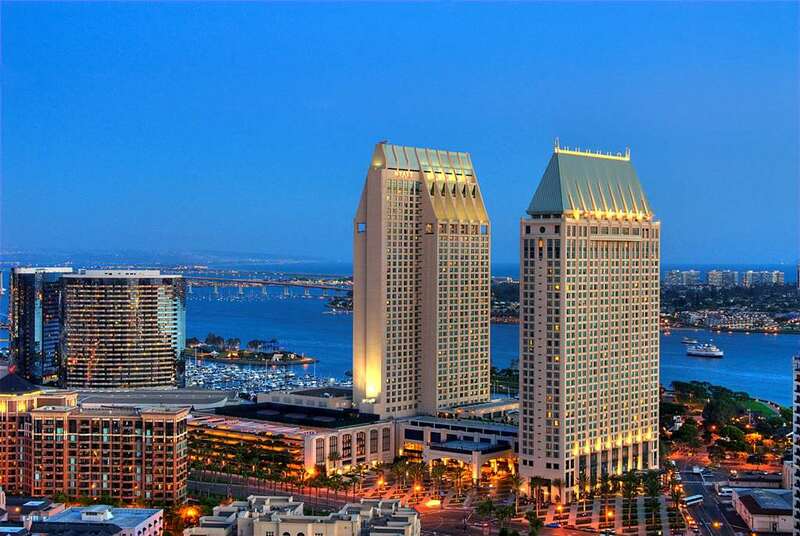 Manchester Grand Hyatt San Diego is a luxury downtown waterfront hotel on the San Diego Bay Adjacent to Seaport Village, Headquarters and the San Diego Convention Center. The San Diego Intl. Airport is 3 miles away. The hotel is walking distance to the business district and shopping at Horton Plaza. The San Diego Zoo and Balboa Park is 3 miles away, Sea World is 7 miles away. The Amtrak train station is 5 blocks away from the hotel.